Precision Swiss made tweezers with replaceable tips. The tips are made from polyetheretherketone (PEEK) and are reinforced with carbon fibre. They have a high rigid and flexural strength with very high wear resistance. They have high heat capaciry (260 - 300C) and excellent resistance to chemicals and agressive agents. These tweezers are perfectly suited for withdrawing individual capillaries from their protective tube and general handling of the capillaries. 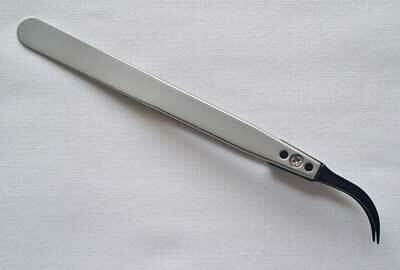 Damage to the neck of the capillary tube is minimised by use of these tweezers. Replacement tips are available.